Today, most small insectivorous or omnivorous birds belong to the Passeriformes, which also constitute the majority of perching birds. As noted in Sect. 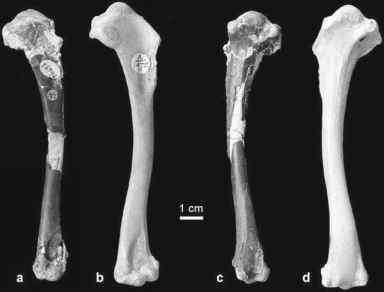 16.4.2, there exist remains of presumptive passerines from the early Eocene of Australia. Outside this continent, passerines first occur in the early Oligocene of Europe, where they did not become the predominant group of small arboreal birds before the late Oligocene. Passerines have no Paleogene fossil record in the New World and Africa; in the latter continent they have not even been recorded in early Miocene deposits (Mourer-Chauvire 2003). Both the phylogenetic relationships of the extant taxa and the fossil record are in concordance with an origin of Pan-Passeriformes in the Australian region (Sects. 16.4.2, 17.2.1). Dispersal of passerines into Europe seems to have been from Asia, and may have been correlated with the northward drift of the Australian continental plate in the mid-Paleogene and closure of the Turgai Strait in the early Oligocene. Paleogene. The crown group representatives of some taxa with putatively insectivorous or omnivorous Paleogene stem group representatives further exhibit feeding specializations or foraging strategies that are not, or are only rarely, found in passeriform birds (Mayr 2005a). For example, crown group Upupiformes either forage on the ground (Upupidae) or are specialized toward trunk-climbing (Phoeniculidae), whereas the Messelirri-soridae, as evidenced by their foot structure, seem to have been perching birds (Mayr 1998b). Within crown group Pici, the Picumninae and Picinae are specialized toward trunk-climbing and wood-pecking, the Indicatoridae mainly feed on beeswax, and toucans and many other Ramphastidae mostly eat fruits. By contrast and according to its bill morphology, the early Oligocene piciform Rupelramphastoides appears to have been a rather generalized insectivorous or omnivorous bird (Mayr 2006g). The Coliiformes exhibited a great diversity in the Eocene and, judging from their bill shape, included omnivorous or insectivorous species by that time (Houde and Olson 1992; Mayr and Peters 1998; Mayr 2001d), whereas the six modern species of mousebirds are mainly frugivorous. The cacique-like beak of Chascacocolius (Sect. 16.2.2) is a particularly striking example for a passerine-like feeding adaptation in Paleogene non-Passeriformes. As indicated by their bill-shape, the Eocene stem group Psittaciformes of the taxon Psittacopes also appear to have been rather generalized feeders (Mayr and Daniels 1998), whereas extant parrots exhibit specialized feeding adaptations for various food sources which are used by few passerines (e.g., very hard-shelled seeds, roots, pollen, and nectar).